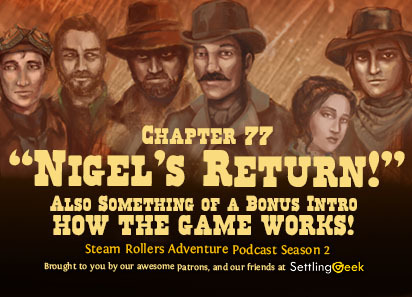 The Steam Rollers Adventure Podcast: Ep.140 Ch.77 "Nigel's Return!" NOTE: This episode features a bonus within an extended intro: An explanation of our game mechanics. If you're interested in how the Heart of Bronze Adventure Game works, check this out! Our story continues where it left off, with the party worrying on what to do with the information they received from Matthew (Future Shiloh) Teamer, and then...Nigel returns!